Hello travelers! Have you heard of Go Hotels rooms promo? Well, this budget hotel chain with branches in different parts of the country is offering hotel room sale for as low as P588 per room per night stay plus VAT. 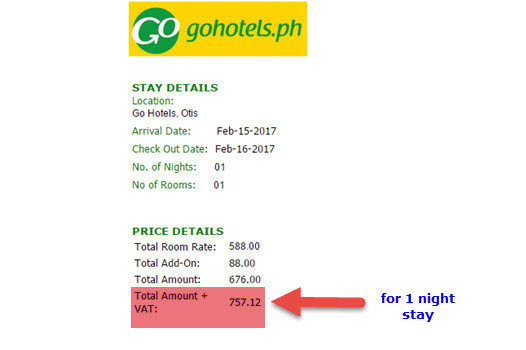 This Go Hotels room promo is good for hotel stay from February 1 until March 31, 2017. Booking for the hotel promo is ongoing and will end on January 16. You can save on your vacation or trip expenses by availing hotel room promos and airline sale tickets which are offered by several airline companies nowadays. It’s true, hotel stay in Go Hotels is affordable and budget friendly. Just look at the Go Hotel sample booking below for 1 night stay. 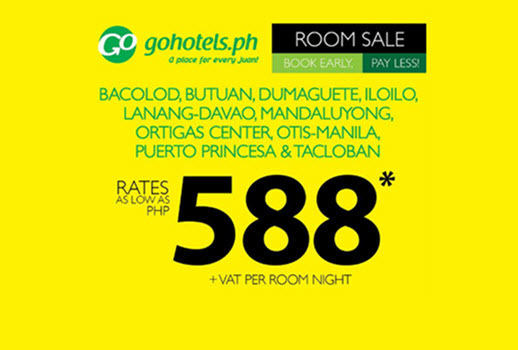 When you book for the Go Hotel P588 room sale, you will pay only a total P757.12 for one night stay. Breakfast is not included in the rate, however, you can pre-order it when you make your booking at www.gohotels.ph. You may also call their hotline at (63-2) 398 8788. Book your hotel rooms now to avail of the promo rates. When booking, you may choose either the Twin room or Queen room. Both rooms are good for 2 adults and 1 child. To get the hotel discounted room rate, make an advance booking for the hotel room. Room sale booking is until January 16, 2017 only. Make up your mind now where you will go for your vacation and check if there is a Go Hotel nearby so you can book the discounted hotel room stay and save on accommodation expenses!